Here is a video (in which I talk fast and breathlessly and say the wrong day of the week) about 1) what to expect and look forward to in the Family Proclamation Celebration, and 2) how you can get more involved. Also, grab and share the button over there on the sidebar (—>) to help more people find what we’re doing. So before we even begin to study the contents of The Family: A Proclamation to the World, I want you to know that I believe God speaks to us today through living prophets and apostles. I know that when I have heard and obeyed their counsel, the promised blessings have come. The world we live in is increasingly dark, angry, and confusing, but our Heavenly Father sends us guidance and direction through His servants, and He sends confirmation of those teachings through personal revelation. The Creation of the earth was the creation of an earth where a family could live. It was a creation of a man and a woman who were the two essential halves of a family. It was not about a creation of a man and a woman who happened to have a family. It was intentional all along that Adam and Eve form an eternal family. It was part of the plan that these two be sealed and form an eternal family unit. That was the plan of happiness. The Fall provided a way for the family to grow.Through the leadership of Eve and Adam, they chose to have a mortal experience. The Fall made it possible for Adam and Eve to have a family, to have sons and daughters. They needed to grow in numbers and grow in experience. The Fall provided that for the family. The Atonement allows for the family to be sealed together eternally. It allows for families to have eternal growth and perfection. The plan of happiness and the plan of salvation was a plan created for families. I don’t think very many of the rising generation understand that the main pillars of our theology are centered in the family. When we speak of qualifying for the blessings of eternal life, we mean qualifying for the blessings of eternal families. This was Christ’s doctrine. What does this theology teach us about ourselves? What does it point us toward and what does it turn us away from? Sister Beck later taught that anything that is anti-family is anti-Christ. We must hold family in highest regard, not just in our faith structure, but in our hearts, in our calendars, in our covenants, and in our choices. I used to look at other moms with their glaring talents and abilities so different from my own and wonder if I was somehow an underachiever. On other occasions, someone would come up to me and compliment me on something they thought I did well and they wished they could do better. I have learned to recognize that perhaps if I had someone else’s talents instead of my own, I wouldn’t be the mother that my children need. Heavenly Father knew my children (and me) before they were born, and He knows exactly what their little spirits need to learn and progress. And he gave them me. Me. There’s something about all of us being together in a family and navigating this life with each other’s help that polishes us and grows us. The closer we come to each other by applying the principles in the Proclamation, the closer we come to Jesus Christ. Families are central in Heavenly Father’s plan, indeed, but my family is central in my plan too, and I’m so glad I can count on His help. 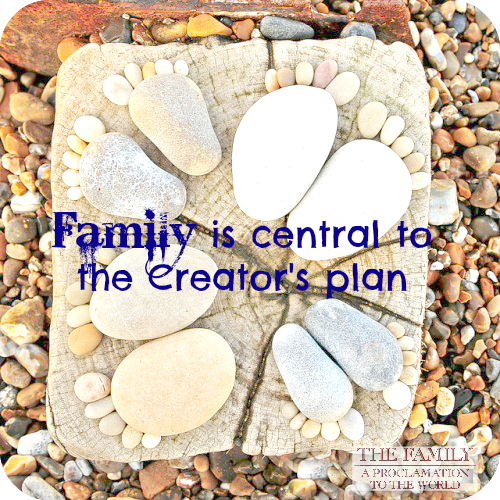 How is your family “central” to you? 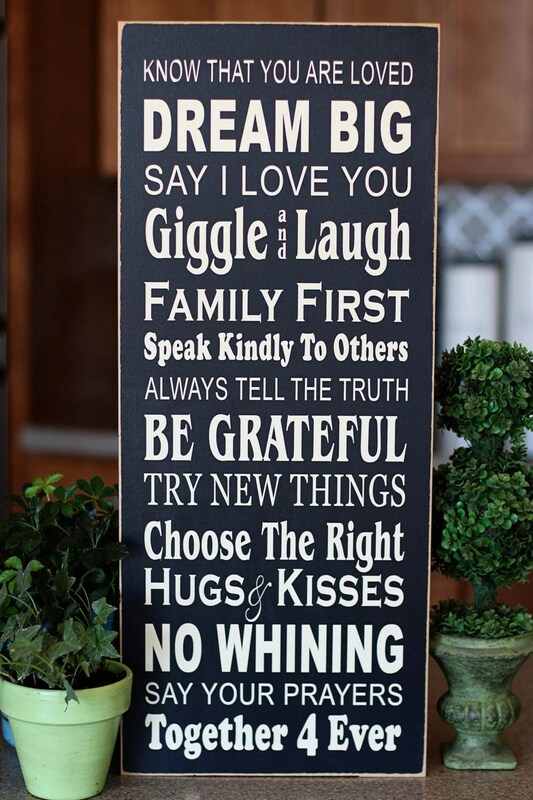 Click here to read a complete version of The Family: A Proclamation to the World. The celebration will continue from Sept 17-30. Thank you for reminding me that I am the mother my children need. This is may sound like it is coming out of left -field. Maybe not. Stick with me. In the Major that I am in, (Religious Studies) my religion comes up ALOT! An issue that keeps coming up, is the idea of creating our own world- people want to know about that. I just quote RIchard Bushman most of the time- but as I was leaving a class one day, a thought hit me in a very strong way- that we are creating RIGHT NOW. Our agency is power, and creates things- we are creating our own worlds right now. This is done, in God’s plan, within the family. Our reward after this life we will be what we create here and now. Of course we will have eternity to perfect what we we do here, and through the Atonement of Jesus Christ any damage that was beyond our capabilities and control will be repaired. However, I got a glimpse of the big picture. What we do outside of our families is nothing compared to what we do withinour families- that is what we take with us- so we need to build them now, use our agency to create a beautiful enviroment for our family to thrive, and we get to keep all of that. I was in awe at the glimpse I got, and the perpective shift I received in that moment. I am in school for the benifit of my family. Better get to studying! My “favorite” testimony about parenting is that each of us is the perfect parent/caregiver of the ones entrusted to us. Sometimes it takes crazy paths to get a family together and yet that family contains exactly who it should. The heartache and trials along the way refine us and mature us to better live out the responsibilities we have. I am so excited for this Family Proclamation Celebration! This celebration could not have come at a better time for me. A reminder to celebrate my family at the level we are. Right now its just my husband and I we had been doing foster care but due to some uncontrollable circumstances we recently had to stop doing such and its been a struggle and a challenge. I also have a member of my extended family whom we are all struggling with due to some choices they’ve made and I loved ajpassey’s comment. The path is all different and crazy to get to the gate of following the teachings of Christ. Thank you for sharing your testimony. I am so very excited for this Proclamation Celebration. First, thank you for creating and hosting this blog hop. I love reading all the wonderful posts relating to family. When I was a teen I never really had a desire to have a family. I knew I would but it wasn’t what I was most excited about in life. Didn’t particularly care for kids so thought I’d have a couple and move in with my life. Thankfully Heavenly Father knew better than I what my life needed to be. I now have nine marvelous children and one amazing husband who are literally the center of my life. I am fortunate to be able to be home and to hopefully create that nurturing environment that my family needs. Looking forward to the next two weeks! This month has been declared family month at our house. This blog series is really timely for me. I just spent two hard weeks debating between using my talents to go back to work and ease the financial burdens felt by my husband trying to work and go to school as we pay off student debt and try to get out from under a bad house loan, or to use them to teach my children at home to compensate for the poor schools here that aren’t meeting their needs. We have been h omeschooling for a week now and it was definitely the right choice. I am using to Family Procolamation as our gospel study unit this month, as a reminder to us all why we do what we do. Love stopping in here. You always have inspiring and uplifting thoughts to share. Wow .. it’s this time of year again? Where did the last 12 months go?! I’m glad you’re participating .. I do enjoy your blog so much. Yay for family! Oh my goodness, I love it! I had never thought about how my particular strengths are to help my family and that’s a good enough reason not to compare myself to other mothers! I have been making changes so that my children KNOW they are central to me. We have group hugs at prayer time (most of the time), I always make sure I leave my son at school with a hug and kiss, and pack a mommy love note in his lunch. I am taking time to play with them and show them things. I am trying to be more deliberate and I am noticing small things here and there. I love how you wrote, “We must hold family in highest regard, not just in our faith structure, but in our hearts, in our calendars, in our covenants, and in our choices.” I especially liked the “calendars” part. We truly have to make our calendars revolve around what’s best for our family. I’m involved in the pit orchestra for a show right now and it’s kind of crazy (though very temporary) and it has helped me to see how I must safeguard my time with my family. Thanks for sharing this. My family is not a traditional on rather a blended one. I’ve learned that the Lord certainly does know what he is doing and puts people together for a reason. I love my step kids as if they were my own, I love my daughter more than I could ever describe and I love my step kids just as much. The relationships are all unique and equally amazing. My Mother was telling me about Elder Oaks talk at the Utah County regional stake conference yesterday. She said that Sister oaks spoke for a bit in the middle of his talk and then she handed it back over to him. She said that she spoke about this very thing that the Lord knows what he is doing and does it on his time table which may be different from what we expect or have in mind. That she is enjoying beautiful relationships with all of her grandchildren, and children that she has through her marriage even though she has never actually given birth. I am paraphrasing based on what my Mother told me, does anyone have the link to his talk so that I can read it or listen to it? I tried to find it but maybe I am not looking in the right place? If anyone can send it my way I would really appreciate it, and I think that it completely relates to this discussion. I think based on what my Mother told me, like I said I haven’t heard or read it myself. Thanks and have a wonderful day! My goodness! How could I never have thought of it this way before? Absolutely spot on, Stephanie. Such a simple thought, and yet for me at least it has such a deep meaning – I definitely have some thinking (and action taking) to do regarding this! My family has become more central to me as I have taken more time to be with them and to put them first. I have found that simple things like teaching them to help with chores, to be kind to other’s and do other daily things have helped and blessed us all. What a great insight .. thank you so much for sharing this with us! Thank you for sharing his insight with us!